If you're in Bali for a vacation, you can't leave without trying out the most popular water sport on the tropical island, scuba diving. Without requiring any prior experience, this scuba diving day trip takes you upto 40 feet under the Bali Sea, where colourful fishes swim among gorgeous corals and reefs. 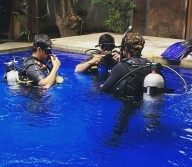 Before taking the plunge, you'll prepare with a short training session in a swimming pool to learn basic scuba skills like how to breath and communicate underwater. 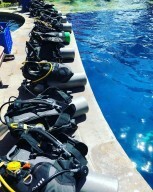 Throughout the adventure, a certified dive instructor will be present to guide you at every step. NOTE: All prices displayed are subject to fluctuations based on international currency exchange rates at the time of booking. This scuba diving trip in Bali takes you to the gorgeous dive spots near Amed in Bali. These dive spots, with minimal ocean current and moderate water temperatures, are perfect for amateur scuba divers completing their first open water dives. The most well-known locations in these waters include the Jemeluk Bay, a shallow and rich coral garden, the Jemeluk Wall, an impressive abyss in the Bali Sea, and the Deep Blue, a shallow bay of coral boomies. From schools of barracudas and moray eels to black tip reef sharks and sea turtles, these dive spots of Amed feature a widely diverse marine life. • Learn introductory skills and techniques of scuba diving. • Take your first step in the adventure sport of scuba diving. • Complete one open water dive in the Bali Sea. • Explore a range of fascinating marine life and vibrant reefs. Travellers are required to follow instructions of the dive instructor during the scuba trip. Consumption of alcohol and drugs is strictly prohibited during the trip. Consumption of tobacco products like cigarettes is not recommended. For cancellations made more than 30 days before your scheduled scuba dive in Bali: 100% refund. For cancellations made between 7-30 days before the start of your scheduled scuba dive in Bali: 50% refund. For cancellations made less than 7 days before your scheduled scuba dive in Bali: no refund. All refunds will be processed after deducting any international payment transfer fees. 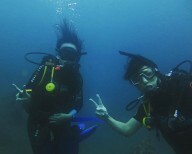 Please check with us what these fees will be for this scuba dive in Bali. Travellers from outside Indonesia are requested to carry enough cash in the local currency to cover any personal or incidental expenses. The tour operator reserves the right to alter or cancel the itinerary of this scuba diving trip in Bali due to any unforeseen circumstances to ensure maximum safety of travellers and staff. Costs arising due to such a change in itinerary are borne by the traveller. All prices displayed are subject to fluctuations based on international currency exchange rates at the time of booking. Accordingly, prices may be subject to a foreign currency premium/discount. Discover Scuba Diving in Bali! Your day begins with a short theory session at the dive center where a certified dive instructor will quickly run you through the basic skills of scuba diving. This is followed by a training session in the swimming pool to prepare you for the open water dive. Once you are ready and confident, you'll head out from the island to specific dive sites and swim down 40 feet deep with your dive instructor. You'll also explore a wide array of the marine life, from crabs to sea turtles, and admire gorgeous views of reefs and corals covering the dive site. The day's session ends by late afternoon. Your trip ends here. Explore gorgeous scenes on the floor of the Bali Sea. Personal expenses such as meals or beverages etc. Bali is well-connected to most major cities of the world via frequent flights to the Ngurah Rai International Airport. You'll be picked-up from your hotel or place of accommodation in Bali only if it is located either in Amed or Tulamben. Bali is well-connected to most major cities of the world via frequent flights to the Ngurah Rai International Airport. Your dive center, located in Amed, is located 3-hr drive from the airport. You can hire a taxi or private cab to travel from the airport.